Many people don’t believe that migraines are a real problem. The Lift The Burden team is working tirelessly to document the prevalence and impact of migraine and headaches around the world. The goal is of course to influence politicians and get more resources to study and treat migraine and headaches. 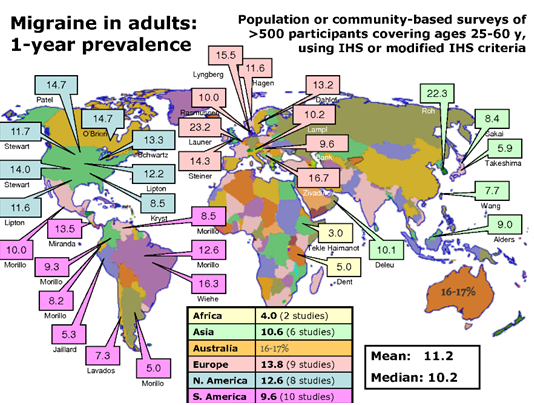 Knocking on the door of households in India, China and Africa, they obtained interesting numbers: the prevalence of migraine is 34% in Nepal, 25% in India and 20% in Russia. And even if people in developing countries have other problems to deal with, migraine is still a serious issue because whatever the situation you are struggling with, a migraine attack can be very disabling. OK, migraine is frequent and disabling (as a migraine sufferer you know this). But can something be done about it? Headache Centers have been examined in Europe for quality criteria. Now we know what a good Headache Center is. The next crucial step is to show that caring for headaches leads to a significant improvement in quality of life, productivity…and a decrease in health costs. You want more support for headache care? Contact your local headache patient association.